Size10 ½ in. x 8 ½ in. 10 ½ in. x 8 ½ in. Born in Soerabaija, Java, Margaret Patterson is remembered primarily for her wood blocks, most now lost or destroyed. 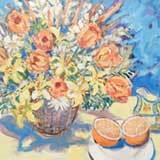 She also did highly colorful paintings, called a “celebration on canvas”, and she worked in both watercolor and oil. Patterson attended school in Boston and taught public school art in Portsmouth, New Hampshire, and Southbridge, Massachusetts. She taught in the Boston Public Schools for almost twenty years, and in 1915 became the Director of the Art Department at the Dana hall School in Wellesley, Massachusetts, a position she held for thirty-five years. During her summers, she frequently traveled to Cape Cod.